For us curlies, it was a dismal showing at the People's Choice Awards 2012. But since even the darkest of clouds have a silver lining, here is how you can get the few curly celebrity hairstyles that did make an appearance. We say, next year, we all vote for more curly looks — after all, it is the people's choice and we are the 60 percent! 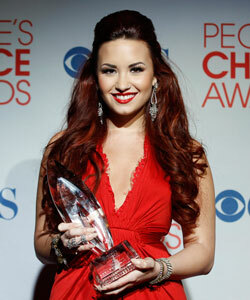 Demi Lovato, Favorite Pop Artist, shined in the spotlight with her fiery type 2A red hair. With lots of volume and long, voluminous curls she looked stunning. To recreate, use a volumizing mousse to create a loose and airy curl, then tease the top and pin it back for a sleek look. Ginnifer Goodwin looked drop dead gorgeous with her vintage finger wave bob. With her type 2C curls, use a hard hold gel and start with wet hair, create a deep side part, then take a comb and lightly set the curls side to side to give the finger wave look. Then air dry or lightly diffuse without disturbing the curls. Faith Hill was as glamorous as always with her fabulous and big type 2A waves. Use a volumizing gel and a smoothing cream together to give the curls volume and definition, then create a deep center part and lightly finger the curls away from your face before setting dry. Adam Sandler, Favorite Comedic Movie Actor, the funny man himself, kept his type 3C curls short and cropped with a great paste to add control. 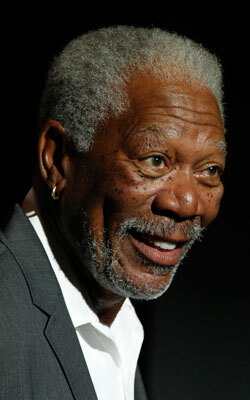 Morgan Freeman, Movie Icon, held his own for this great award with his type 4A silver fox curls. He kept his hair shiny with a good moisturizing oil, like argon or moroccan.